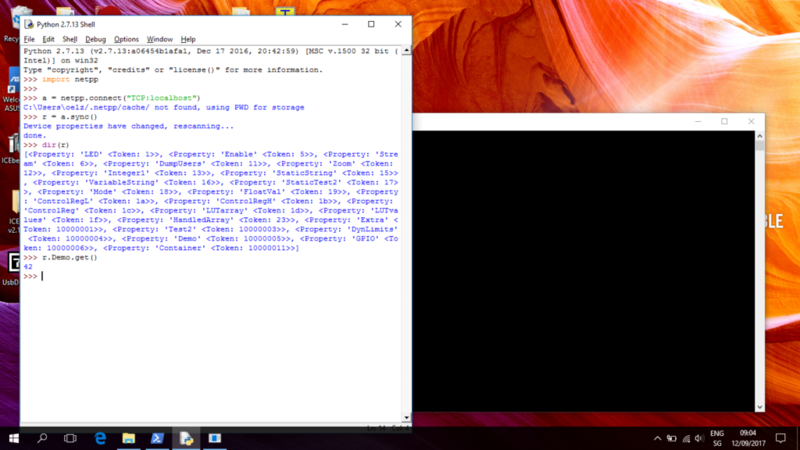 Download Python 2.7 (32 bit) and install it. Make sure to install for all users, otherwise the netpp installer will not find the Python directory and complain. Run the example server via Start Menu->netpp->Run example server. A warning will appear and request you to unblock the service, possibly. Then, a small example netpp server is listening on your local machine. If you did not download Python before installing netpp, the netpp installer will throw a warning, but still continue. When you have started IDLE, first try to import the netpp module as shown in the screen shot. Then make a connection to your local example server using the .connect() method. The .sync() command creates a local property tree with root node ‘r’. When first called, the device server is queried for all available properties, so this can take a long time on some systems. Once the query has completed, the tree is stored in a cache and is only reloaded, if the device properties have changed. Note the message “using PWD for storage”. If you have no cache directory created, the cache will be installed in the current program’s working directory, which may not be desired. Create the folders ‘.netpp/cache’ in your home directory, then the warning will go away. If you ever need to manually delete the cache files, you will find them there. Next, we are going to look at the properties. This is simply done the pythonish way using ‘dir’. And last, we obtain a property value using the .get() method. Simple as that. and it will list the device’s properties. The netpp-cli.exe is an interactive console with a bit more caching functionality and session character, i.e. when you made a connection, the device will reserve a session with you until you exit the CLI. This operation mode may be required on some more complex devices that work session based. At the netpp prompt, type ‘?’. Now you can just get a property value by typing its property name, like Container.Test. When you append a value, you can change a property, likewise. 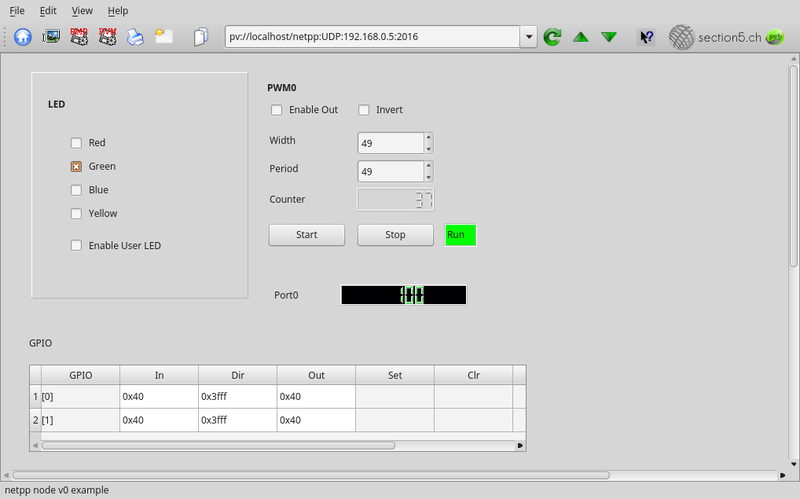 To use the predefined GUI process control based on the free pvbrowser (see github repository), you need a demo setup based on a modhub or another Linux embedded demo setup running a pvhub server. This assumes a netpp node setup with default design. into the pvbrowser for a direct connection to the netpp node (assuming default IP at 192.168.0.5). Replace ‘modhub’ by the IP address of your pvhub server host. I am glad to announce a new user evaluation platform module called ‘netpp node’. Its motto is ‘IoT on FPGA done right’. See detailed specs and preliminary order information here: [ refdesigns/netpp_node ]. The netpp node engineering samples v0.0 have just passed the long term burn-in. Running since approx. 11 weeks non-stop, the units are flooded with netpp requests from an embedded PC and have shown no failure in the hardware, except a reboot resulting from a power outage. Received the series! So finally we can ramp up with the delivery to beta developers…(thanks for being so patient). For analog I/O, U3 on the board is by default populated with a MSP430G2553, functioning as a smart ADC that is controlled from the ZPUng ‘dagobert’ SoC via i2c. All relevant ADC configuration registers are directly accessible via netpp. 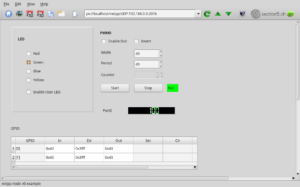 For instance, we access the low level registers through a process browser panel as shown above to play with the parameters. 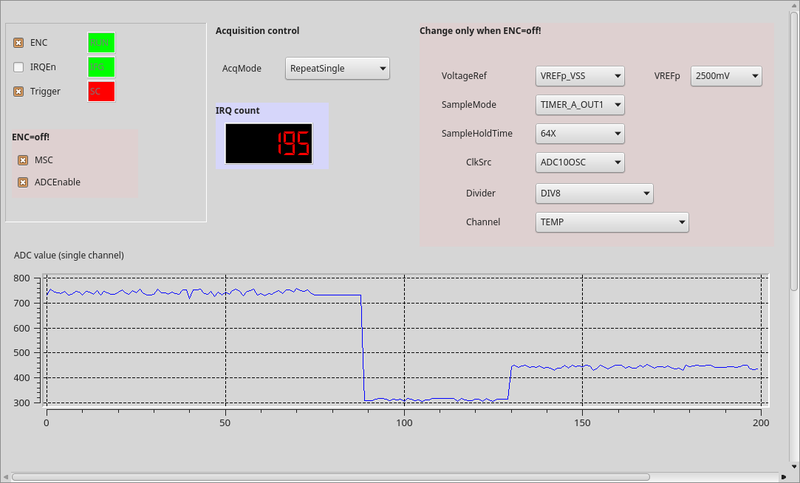 The process view panel automatically updates the volatile properties from the netpp peer device. The ADC10 variant of the netpp node provides up to six analog channels internally sampled at up to 200ksps. When in synchronous acquisition configuration (SPI master), only five channels can be used. 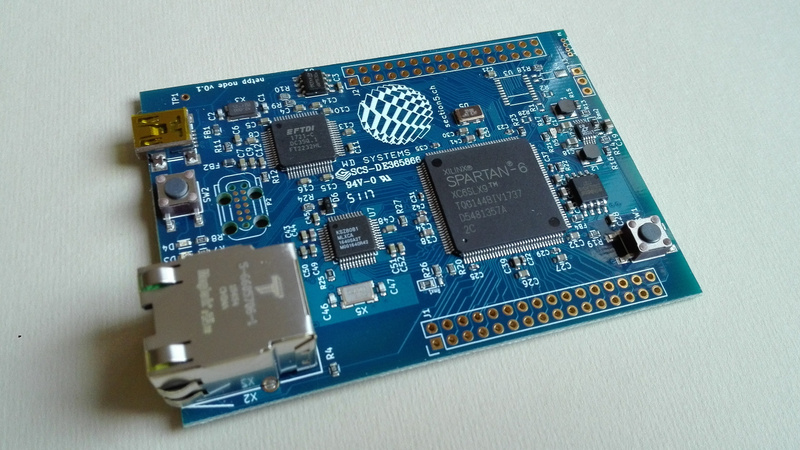 The alternate population option with a MSP430F2013 provides a Sigma-Delta 16 bit ADC with differential inputs and programmable gain amplifier. This variant provides three different input channel configurations using the provided analog input pins on this board. Moreover, the internal temperature is available in a separate channel. By default, the analog sensors are polled, i.e. a measurement value is delivered upon request by the master. 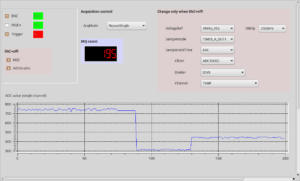 For synchronous sampling however, a ‘push’ strategy might be desired, where a netpp node delivers a value stream to a data logger or database. This can be netpp (where the netpp node acts as a master), however for high speed data transfers (‘network scope’), a low overhead UDP stream is more desirable. The dagobert SoC features a data port option with programmable slots to stream I/O channels as well as analog values using a standard real time protocol with 90 kHz time stamps. 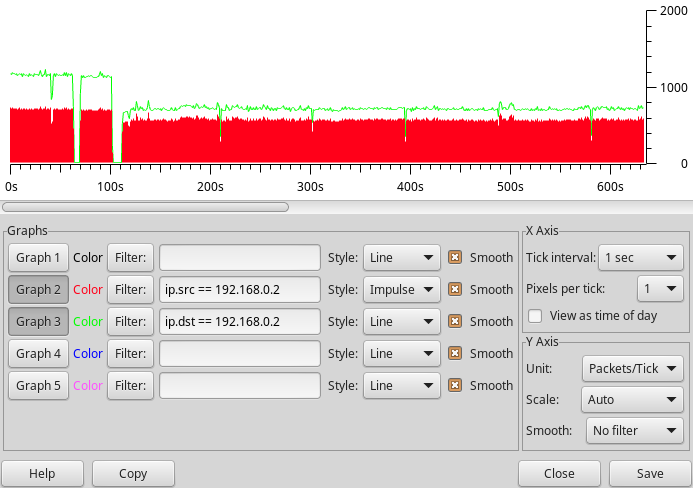 Packet behaviour in a real network is measured using the Wireshark protocol analyzer. The figure below shows some example netpp transaction log that the netpp node handles at a very low CPU overhead based on direct register accesses.The red bars is the effective number of query responses using somewhat ineffective ping-pong requests. The performance can be increased by accumulating data into larger buffer properties. 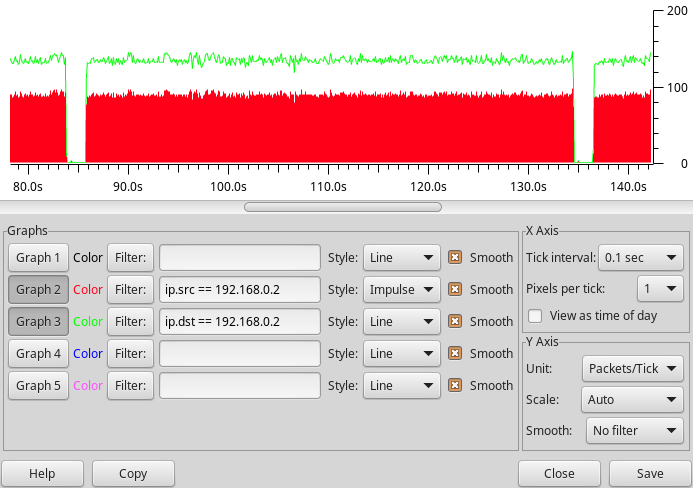 For i2c or SPI transactions however, the packet rate is expected way lower. For high speed performance like MJPEG video streaming, a separate UDP/RTP queue can be set up within the firmware to reach maximum throughput. However, there is no handshaking using this method. The image below shows a repeated property query from within Python. The pauses are introduced by external disturbance (stress test) that causes a packet drop – and the netpp engine to timeout and re-synchronize. The default boot loader firmware supports self-programming over the cable. That means, the netpp_node can be supplied remotely with a new firmware image via a simple upgrade procedure over netpp. If the uploaded image is faulty, the system will fall back to the default boot loader. However, if the new design itself has errors, the system will be unable to recover unless the reset button is pressed. Jumbo packet flooding was tested, however support can not be enabled on this platform for the receiver queue. It is however possible under certain circumstances to generate (TX) Jumbo packets for experimental purposes. The performance gain is however minimal. There is FreeRTOS and eCos support code for the ZPU architecture. However, I have no plans in going down that road, you’d be on your own. A NuttX port is currently under evaluation and may likely be released in a few months time. NO PROMISES! Code size is an issue on this particular platform, larger programs (TCP stacks) need to move to the SPI flash overlay program space. Since this involves caching, the program timing is no longer fully deterministic and the RTOS functionality can only apply to program code running in the L1 memory.